People will remember a special cocktail and your welcoming bar or event when you serve their drink with engraved beverage stones or custom coasters. 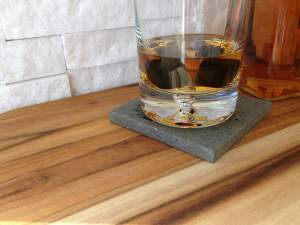 Making a great “clink” in bourbon or whiskey, stones engraved with your logo can sit atop coasters featuring a name or favorite saying about adult beverages. Unlike many other gifts, beverage stones are more than just something attractive to look at. The Beverage Cubes (available in three sizes) are made of Basalt stone, stored in a freezer and safe to add to drinks, while the coasters are stable enough to hold a tumbler of even the finest whiskey. Share your brand and message in a way that's attractive and memorable. Beverage cubes and custom coasters will be the perfect gift or addition to your bar top!